Concord has a state of the art Chemical R&D facility for extraction, isolation and purification of product from upstream (fermentation) process. The facility is having a scaled down version of all the major equipments at plant, thus giving high flexibility during process scale up. 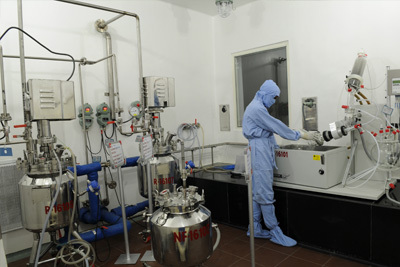 R&D facility is equipped with all essential equipments for complex organic synthesis chemistry. Some of the major equipments are various filtration units like Micro filtration, Ultra filtration and Nano filtration, SS-316 reactors, Rotavapour, Hydrogenater, Preparative HPCL, Open column chromatography, Flash chromatography, various drying and filtration systems. Development of Downstream process for new API’s and Intermediates, which Concord intends to commercialize within defined timelines. Development of non-infringing processes to support P-IV product launch. Undertaking Contract Research & Manufacturing projects and ensuring its timely completion.